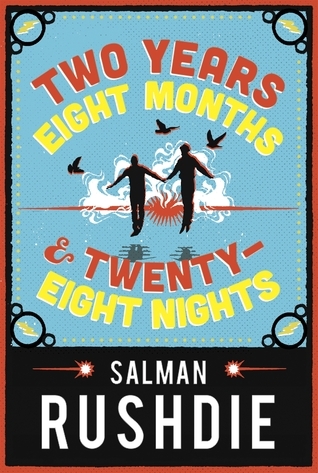 Two Years, Eight Months and Twenty-eight Nights (an allusion to the 1001 nights of Scheherazade’s storytelling) begins with a love story. A medieval Muslim philosopher called Ibn Rashd (known to us in the 21st century by his Latinised name Averroës) is exiled from his home town of Cordoba because he taught that natural phenomena obeyed natural laws that God had created. Although today Ibn Rashd is acknowledged as the ‘founding father of secular thought’, in his own time he was less influential than his rival Al-Ghazali of Tus who argued that the only law that exists is what God wills, and that anyone who disagrees with faith is incoherent. (And alas, this idea still has its adherents who use it to justify atrocities). Sent to a place where he does not belong (migration is a frequent theme in Rushdie’s books) Ibn Rushd falls in love with Dunia, a jinnia, (i.e. a female jinn or genie), because these events take place at a time when the slits in the world are open and jinns who are normally quiescent, are out and about. Dunia thus becomes a mythical matriarch, producing innumerable offspring who combine the human qualities of their father and the quixotic characteristics of a supernatural creature from the unknown world. These offspring spread to the four corners of the world, and closer to our time, end up doing battle with more malevolent jinns when in the period of The Strangeness lasting two years, eights months and twenty-eight nights, the world is under siege from amoral and hostile beings who make Banville’s mischief-makers look like innocents. We meet Mr Geronimo first, a man baffled by a mysterious phenomena that follows The Great Storm. He finds himself levitated slightly above the ground, the distance between his feet and the floor rising slightly as time passes and becoming more noticeable. Mr Geronimo, his middle name anglicised by Americans, was born Raphael Hieronymus Manezes in Bombay in India, and is the illegitimate offspring of Father Jerry D’Niza who uproots him and sends him to New York to learn architecture. Like all of Dunia’s offspring Mr Geronimo is marked by the absence of ear lobes, and his destiny and his doom is to be out of step with God, ahead of our time or behind it. Mr Geronimo is a likeable character who chooses the humble work of gardening rather than more ambitious architecture, and the reader feels his travails keenly. Next up is street-smart Jimmy Kapoor, who is terrorised by a jinn manifestation of his own comic-book creation, a superhero called Natraj Hero bursting into his bedroom. Dunia turns up to warn him to leave because she can’t protect him from the danger, but (as you might imagine) Jimmy has trouble convincing his mother and cousin that there’s a malevolent jinn out to get them. Also making her way through the slits into our world during the storm is the foundling Baby Storm Doe. She turns out to have a unique gift, of great value to her adoptive mother Mayor Rosa Fast, because she causes skin to rot whenever she detects corruption. Finally there is Teresa Saca Cuartos, who is as flamboyantly tough and brave as she had to be – admittedly a flawed being with a limited capacity for empathy but with a handy no-nonsense attitude to everything. She too joins the fight to rid the world of capricious evil, and becomes one of the champions of this bold story. In the hands of a lesser story-teller all this would be disastrous nonsense, but combining a sense of ideas in flux, a lush style and fluid characterisation works just fine. Enlisting the reader in the fight against dogmatic irrational evil, Rushdie creates a spectacle of wonders. Playful and witty, the novel celebrates difference, duality and the Other, romping along with incorrigible optimism and poking fun, even when dreadful things happen. Very dreadful things do happen. Other reviews are at The Guardian and for a rather humourless feminist critique of it, see Ursula Le Guin’s thoughts, also at The Guardian. See also Becky’s beaut review at Becky’s Books and (after you’ve read the book) her notes and chapter summaries from her second reading. This does actually sound quite entertaining but, honestly, the cover is odd (not that the North American release is better – both look kind of tacky). Sometimes I wonder what book designers are thinking, maybe that his name is all that is needed? Yes, agreed, it doesn’t look like a ‘literary fiction’ book …but it would probably be a hard task to design something for this one. There’s the long, clunky title, and then the story is so fantastical – a cosmic battle between good and evil with heaps of peculiar characters – I wouldn’t know where to begin. I picked up on the theme of “we are all mongrels” (human/jinn in this case) or at least many of us are and really enjoy that in Rushdie. The cover in the US is different – I’m not sure it’s better, though. I like the ‘we are all mongrels’ too, and his joyful acceptance of Otherness. There’s not a single white middle class male in sight!